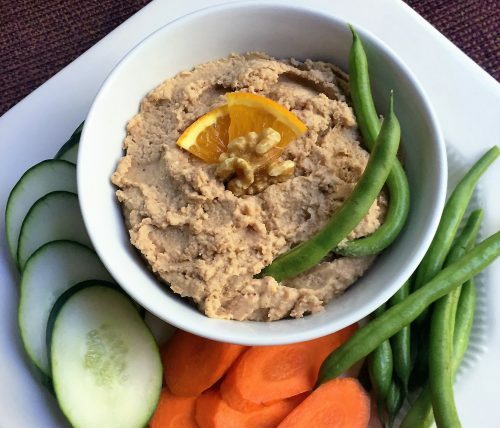 Hummus is having a heyday as a healthy spread and dip, and there are endless variations on the traditional version with chickpeas, tahini (sesame paste), lemon and garlic. 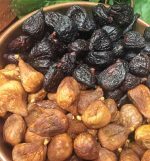 This recipe from California Walnut Board substitutes walnuts and walnut oil for tahini, and orange for lemon juice, but I couldn’t quite imagine the flavors until I made it. 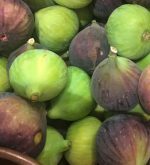 I noticed the recipe in my bundle of ‘swag’ from the International Food Bloggers Conference (IFBC) in Sacramento last week. Now I’m hooked on the taste– a little nutty-bitterness of walnuts and orange zest, with a hint of fruity-orange and garlic. I eat it with the sweetest carrots and green beans ever, from my weekly Riverdog Farm CSA box. Riverdog is a gem of the Capay Valley, one of the most beautiful farming regions in California. I highly recommend a drive through this quaint farmsy area 16 miles west Woodland, off the 505 freeway on the way to Sacramento from San Francisco. Conference attendees were wowed with tours throughout Sacramento, Yolo, and Capay Valleys tasting olive oil, olives, cheeses, pears, peaches, and that is just a sampling of the agriculture-rich central valley’s northern region. I want to LIVE in Sacramento to be near the excellent restaurants, food entrepreneurs, and such astounding agriculture — well, maybe not live in Sacramento, the weather is much hotter than Walnut Creek — but hey, I’m the person to test a California Walnut Board recipe in Walnut Creek, right? Walnuts starred at the conference as a California industry along with California almonds, pistachios, cling peaches, fresh and dried figs, andCalifornia Endive. It’s amazing how endive is grown (recommend you look) in controlled atmosphere from the roots of chicory. 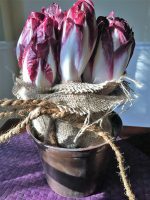 I’ve received several Valentine ‘bouquets’ right on the chicory roots from California Endive. Nearly 100% of domestic endive (pronounced ON-deev, please) is grown in Rio Vista by California Endive. The Sacramento Visitors Bureau generously participated in the conference with their Farm to Fork initiative, showcasing unmatched agriculture and culinary expertise, that as Californians we often take for granted. Check FarmToForkfor a list of events the entire month of September, including tours, a very famous Tower Bridge dinner, and a free festival with live music, chef demonstrations, beer and wine tastings – the Festival website tells it best, just get yourself there! Now to the recipe for Toasted Walnut Hummus. Or get the recipe in this nifty on-line booklet Simple Ways to Use Walnuts. Some of my recipes are on their website too like Green Monster Dip (another hummus-like dip) and Double Walnut Goat Cheese Pizza. Toast walnuts in 350F oven for 8 minutes or until golden brown. (You can use a toaster oven, but watch carefully so as not to burn). Cool nuts. Combine toasted walnuts with oil and garlic in a food processor and puree until smooth. Add chickpeas, orange zest, orange juice, salt and pepper; continue to blend to an even, smooth consistency. *May need a little more orange juice for smoother consistency. Serve with any freshest veggies, pita bread or crackers. Note: Most supermarkets and Trader Joe’s carry walnut oil. I usually buy La Tourangelle brand. Be sure to refrigerate to prevent rancidity. It keeps well, and can be used for salad dressings, pastas, in baking, and as a finishing oil. Very delicious!